Happy Festive season: demo sites, January newsletter and water & energy fantastic news! Thank you for being with us in 2018! #demosites #newsletter #workshops #events and much more is on the schedule for 2019! 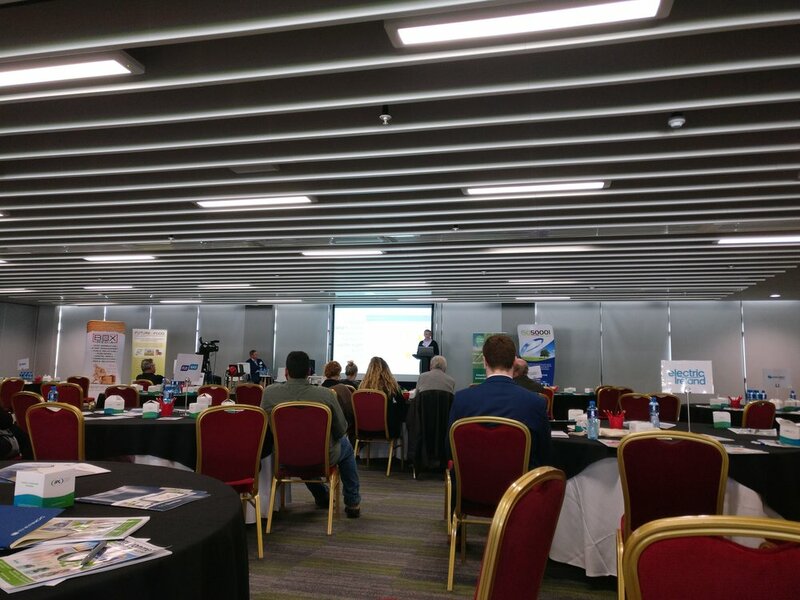 On November 28th, Jan presented the Dwr Uisce project, and our work within heat recovery from commercial kitchen drains, at the Future in Food Conference, at the Pairc Ui Chaoimh, in Cork. His presentation titled ‘DWHR from commercial kitchens: Insights from the Dwr Uisce project’ was part of the Sustainable Development Goals section of the conference. The conference proposed a wide selection of presentations, including environmental sustainability in the food sector, and reducing food waste, but also cyber security, new market development and certification. Jan’s presentation highlighted a sector-wide, technical heat recovery potential in the UK of around 1.35 TWh/year, which could result in a yearly reduction in Carbon equivalent emissions of around 210 000 tons. Jan discussed the effects of the current heating fuel and the kitchen’s hot water consumption on the financial feasibility of such projects and highlighted a mismatch between financial feasibility and environmental benefit for kitchens with smaller hot water consumption. He presented Dwr-Uisce’s laboratory set-up aiming at addressing this unexploited potential. Numerous industrial players and sectoral collaboration programs and platforms with activities in Ireland and the UK presented their work at information desks in the conference venue. A key message was the need for collaboration, and sharing best practices within the sector, this is one of the key activities of the Dwr-Uisce project, as well. Our wicked water and energy problems and how to solve them. An article discussing collaboration among various sectors of the economy and academia to help the #waterindustry innovate is among the most read pieces from Trinity College Dublin published last month. Curious? Figure 1. From left to right, Ana de Almeida Kumlien, Vincent Hargaden, Deepak Doming, Paul Coughlan and Conor Power at the National Concert Hall waiting to welcome the CINet delegation at the conference diner (Monday the 10th September). 2nd Annual Dwr Uisce Water–Energy Innovation #dwruisce2018: what do you need to know! We are approaching the date of our Annual Conference! We are looking forward to see you there. This email summarizes a few things you need to know about the day! Live news for this event can be followed using the hashtag #dwruisce2018 on google. Are you an exhibitor? Would you like to bring any promotional materials? Let our team know so we can try to accommodate your needs. Let us know by 15th October what would you like to bring. 5. WIFI: If you need wifi access sign the wifi sheet during registration and get your unique access code. 6. During the event companies attending will be invited to sign a registration form. This is important for us so that we can report to our funding agency you were at our event. This form may also serve as a registration step for eligible companies to become official members of our network. As such, they can enjoy a range of benefits from our events and research. Visit our website for more info and eligibility criteria. 7. Not coming? Let us know. It is a free event and we have a waiting list of people waiting a place to attend. To follow live news of our events google the hashtag: #dwruisce2018.